Check out this free, fast and easy pattern available now for Dream in Color's gorgeous single ply yarn, Calm. Knit in the round using a mistake rib pattern, you won't want to put down this squishy project. Perfect for holiday gift giving and only takes 1 skein, which is also perfect for holiday savings! First I wound my skein into a cake and found 4 mason jars to make my gradient dye pots. Next I pulled the center out of the cake 3 times, keeping the yarn attached. I ended up winding the out skein on the winder again because it was too big to fit in my jar. (Maybe bigger jars next time?) Then I empties the grape packet into the far right jar and the Cherry packet into the far left jar. I then empties 3/4 of the grape packet into the second from the left jar, and the remaining 1/4 packet into the jar to the left of it. I did the reverse with the fruit punch. I boiled some water in my tea kettle and added it to the Kool-Aid jars. I thought I had put in enough to cover the yarn and then stirred it. I shoved the balls of yarn into the jars and quickly realized that I hadn't added enough water. (See the white yarn?) I tried to add more water, but the dye had already migrated into the yarn and out of the water. Oh well, I was pretty sure it would still look cool. I pulled the balls of yarn out of the water as soon as it was cool enough to touch. See how the water is clear? Pretty crazy right?! I squeezed as much water out of the little bundles of yarn and placed them in a dish to dry. My hands smelled so much like Kool-Aid that I ended up feeling pretty nostalgic for my childhood. I wound it down the next morning, even though it was a little damp still. I probably should have waited because it was a little challenging, but look at this awesome gradient cake!! I took the yarn to the beach and cast on while sitting in the sand on a gorgeous Oregon Spring day. 2 days later! I couldn't stop knitting this cute little sweater as I watched the yarn change colors. The white speckles look kinda cool! So there you have it! 250 yards of Kool-Aid dyed awesomeness! The pattern is in threes: a baby cardigan by Kelly Herdrich. I had so much fun doing this that I'm going to host a Kool-Aid dye day at the shop on Saturday, June 11! This past week a sweet little collection of sock patterns called Socks for Busy B's was released by Portland designer Shannon Squire. You can buy each pattern separately or all together. Check them out on Ravelry and see her collection of other great designs and cue up a few! I had the pleasure to meet Shannon in the Knitted Wit booth at TNNA in January, and she was true to form, knitting away on a sock as we chatted about running yarn shops and such. (She is one of the original creators of Twisted.) I follow her instagram and find it wonderfully inspirational. 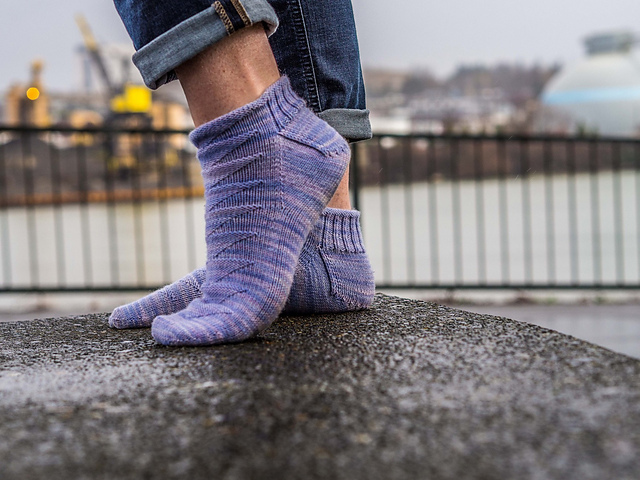 We've been enjoying discovering the mystery behind the Rose City Yarn Crawl's Mystery Knit-A-Long by designers Larissa Brown and Michelle Kroll. The color combinations alone are so fun. Just one look at Larissa Brown's website and you'll see that she is lives a dreamy and creative life. Her designs are whimsical and geometric topped with luscious stitch patterns. We can't wait to have our sample of the ever popular Lichen in store. A fast and fun Springtime knit, ours will be in Blue Sky Alpaca's Worsted Cotton. Coming soon! As you may already know, Lee Meridith of Leethal Knits has been designing unique and creative knitwear right here in Portland in our next door neighborhood. Her passion for color, texture, and structure culminate in truly fantastical patterns. She currently has a mystery hat knit-a-long subscription called the VIP club and has released an amazing shawl collection. We will be hosting a Knit-A-Long with Lee using the custom Triyang pattern which collects all of her shawl options and opens an incredible world of possibility. Stash busting anyone?